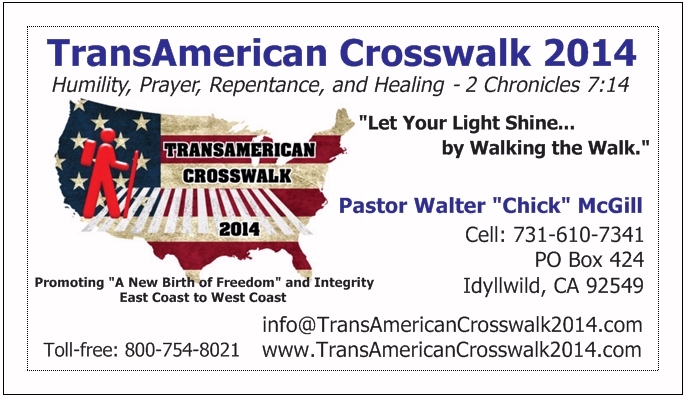 Walk the Walk, East Coast to West Coast, with "The Cross-Country Flagman"
Pastor Walter "Chick" McGill (aka "The Cross-Country Flagman") was a charter member of a church banned by US District Court (after a trademark lawsuit initiated by the Seventh-day Adventist denomination) and was pastor of the Guys, Tennessee congregation. 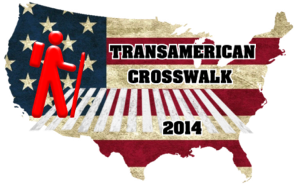 Host of the walk across America, called the TransAmerican Crosswalk 2014 event, he has been a businessman, family counselor, private Christian academy principal, electronics technician, and project director of humanitaritan health services in Uganda East Africa. 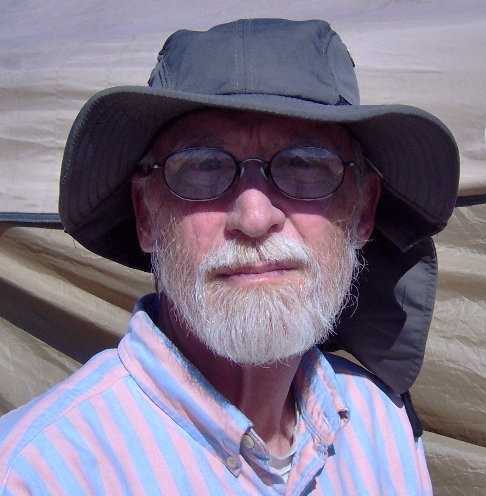 Pastor McGill served in the Vietnam War from 1967 through 1969, and at the finale of the walk, McGill was 69 years old. Barbara Isenburg, the pastor's wife, has volunteered to drive the pace car during the course of the walk. MISSION STATEMENT: To promote "a new birth of freedom" and integrity, restoring self-respect, family values, liberty of conscience, and victorious living while observing the universal principles of God's laws of physical, mental, and spiritual health. MOTTO: "Let Your Light Shine... by Walking the Walk." 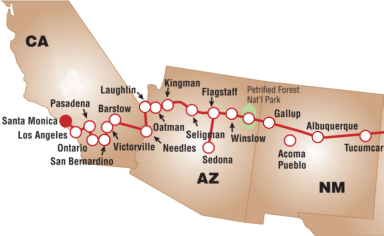 The proposed walking route, an estimated 3,200 miles, begins on U.S. Route 64 in North Carolina, and the last leg connects via Historic U.S. Route 66 in New Mexico and continues to Santa Monica following the "Mother Road" as much as possible. The walk route has been altered several times to avoid dangerous roadways, which has increased the total miles to walk. 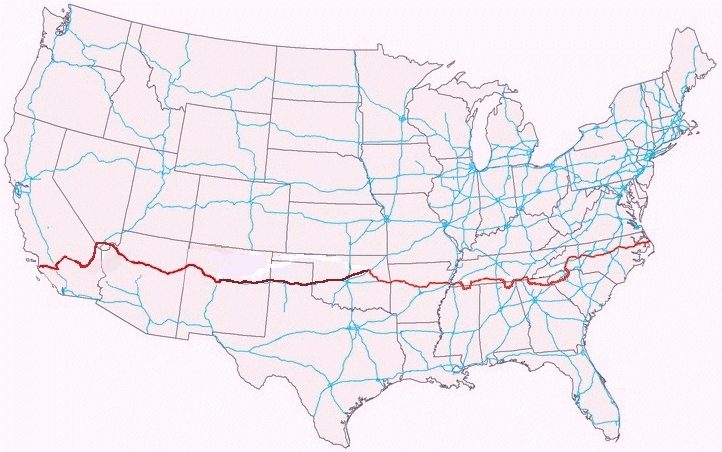 The trek will pass through portions of 13 states, including North Carolina, South Carolina, Georgia, Tennessee, Alabama, Mississippi, Arkansas, Oklahoma, Texas, New Mexico, Arizona, Nevada and California. U.S. Route 64 is an east–west United States highway that runs for 2,326 miles (3,743 km) from eastern North Carolina to just southwest of the Four Corners in northeast Arizona. U.S. Route 66 (US 66 or Route 66), also known as the Will Rogers Highway and colloquially known as the Main Street of America or the Mother Road, was one of the original highways within the U.S. Highway System. Route 66 was established on November 11, 1926—with road signs erected the following year. The highway, which became one of the most famous roads in America, originally ran from Chicago, Illinois, through Missouri, Kansas, Oklahoma, Texas, New Mexico, and Arizona before ending at Los Angeles, California, covering a total of 2,448 miles (3,940 km). A 2004 Ford Taurus SE wagon will function as the "pace car" for the eight-month event. The pace car will be driven ahead of the host (and any other walkers), and the driver will assess the safety of the road ahead, make contact with news media, meet with interested civil and religious organizations along the way, and serve as an emergency transportation vehicle in case of an injured walker. In addition, the driver will plan each day's stops and arrange a place for the walkers to sleep during the nights. Law enforcement is to be notified prior to the walkers reaching their jurisdiction, and permissions requested for special services if necessary. A 2004 Gulf Stream motor-home will serve as a Safe-Station for the time of the walk event. This RV will be parked on the property of "Safe-Station Sponsors" all along the walk route. Pastor McGill, his wife, and up to four other persons can use this vehicle as a place to sleep in safety and comfort each night. In this way, all who participate in the daily walking routine will be refreshed and able to meet a new day's challenge.